Before graduating from Pope John in 1982, Dale Mackel left a legacy. He set the boy’s track two-mile record with a time of 9:24.48, a time that many haven’t even come close to. “I expect all records are set to be broken, and mine will be broken at some point,” Mackel said Monday. Although no one has broken it quite yet, Ryan Pelster, a 2016 graduate of Pope John, had taken quite an interest in that record. As a freshman, his dad promised him a Corvette if he could beat Mackel’s record. It may have seem far-fetched at the time, but it became Pelster’s dream to beat the long-standing mark. 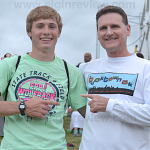 “I started following Ryan, from a running perspective, right away in his high school career. Some of the times he posted when he was a freshman, were just as good, if not better, than mine,” said Mackel. Ryan qualified for state track sophomore, junior, and senior year, and Dale had wanted to come down to watch Ryan compete, but was unable those first two years. Instead he followed Ryan’s track career through the Elgin Review. Mackel’s high school track career ended when he graduated from Pope John. He then ran collegiately at University of Nebraska at Kearney, battling different injuries along the way. After college, he moved to Phoenix, Arizona and worked for Motorola in accounting and finance. He lived in Phoenix for 10 years, and then moved to Chicago, Illinois for 10 years. After college, he ran casually, not competitively for a long time. In 2002, he started to become involved in a very competitive road racing circuit. That lasted about six years, running many five and 10K races and some half marathons and getting very involved in running again. In January of 2008, Mackel moved back to Nebraska and joined Coventry Health Care as their chief financial officer and currently lives in Omaha. When Dale had heard that Ryan had qualified for state track in the 3200 meter run his senior year, he knew this was his last chance to see Ryan run high school track. They hadn’t met each other yet and Mackel decided to surprise Ryan after he had finished his last race. They both described the experience as incredible, one getting to meet his idol, and the other getting to see someone carry on his legacy. Mackel has always enjoyed following all of Elgin’s youth through paper articles and school newsletters. He explained that Elgin offers youth a different experience that kids in metropolitan areas can’t relate to, and he really appreciates that experience now, and hopes to come back to the area for retirement in later years. It was quite an experience for Ryan and Dale, getting to finally meet each other after both hearing about the other throughout the years. Dale describes Ryan as a very genuine and hardworking young man and truly feels inspired by how much Ryan looks up to him.